While many trolley fans contented themselves with tightly-cropped “roster” photos of streetcars in yards, some chose to make their shots in the cars’ working environment on the street. Slow films, lenses and shutters of the 1930s made such views hard to obtain without the effects of car motion ruining the shot. Here, Steve Maguire has resorted to two devices to freeze 1007 reasonably well. The shot is mostly head-on, and the car has slowed for its run through some switches. Signed LAKE TO KODAK PK., car 1007 is westbound on Main Street East at Goodman Street. A 1200-series Peter Witt car follows close behind. The Lincoln-Alliance Bank & Trust Co. building at left is still standing but except for the streets themselves virtually all else in the scene is gone. Maguire made this photo on November 30, 1939 during one of his many trips to the area from his home in New Jersey. The Lake signing of 1007 is of interest. During 1937-1939, the Lake line had not been through-routed; it looped, instead, in downtown Rochester. After the Genesee-Parsells route had been broken by the abandonment of the Genesee line on March 28, 1939, Lake was through-routed with Parsells, an arrangement that lasted until late 1940. In this photo, car 1007 has left East Main Station, located in the extreme distance, and is entering into revenue service. After running through downtown and north on Lake to Kodak Park, 1007 will retrace its way to the point in the photograph. From here, it will turn north on Goodman Street North and travel via Webster Avenue and Parsells Avenue to Parsells loop at Culver Road. The Lake-Parsells route would itself be broken on December 24, 1940 with the replacement early that morning of the Parsells line’s streetcars with buses. Lake would then be through-routed with Main East. 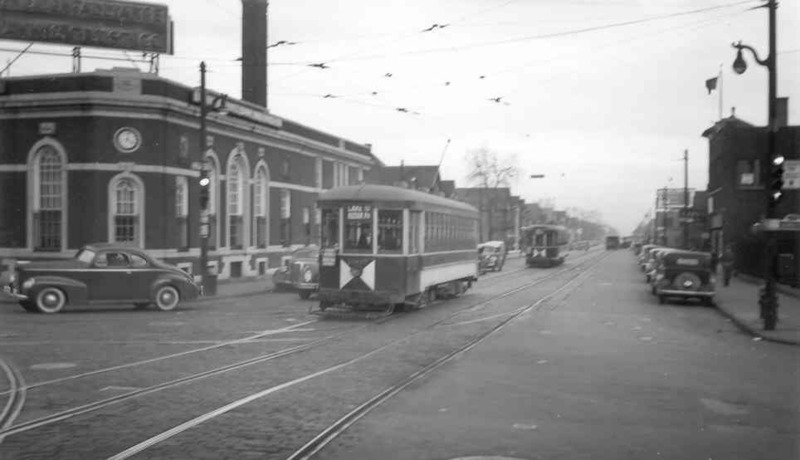 Streetcars of the Lake-Main East route would continue to pass the point shown in Maguire’s photo until the very last surface streetcar runs in Rochester in the early morning hours of April 1, 1941.